Ten years and eighteen movies were all building to the release of this film. Now that we’re here, I think it’s safe to say that the build has paid off. The opening weekend for Infinity War was the biggest of all time at $640.5 million, beating the record set previously by The Force Awakens. It crossed the billion-dollar mark in eleven days, beating the previous record of twelve (again set by Force). Now, in its third weekend, it generated $61.8 million domestically, plus a huge opening in China at $200 million. All together it made $343.1 million worldwide this past weekend, bringing the grand total (for now) to $1.6 billion. This makes it the fifth-highest grossing film of all time, globally—and again, that’s just as things stand right now. The evidence suggests that the film’s still got some legs, so when it’s all said and done, Infinity War may very well be the highest grossing film of all time. How this all got started back in the Bronze Age of comics is a rather interesting and enlightening story. It begins with Jim Starlin. After coming out of the Navy—and fanzines—Starlin did a couple of horror jobs for DC before catching on with Marvel in early ’72. He did a lot of work here and there while breaking in at the House of Ideas, including a bunch of covers for UK reprints, before finally getting the regular assignment on Iron Man. Not only did he get the penciling assignment, but he would also be allowed to do some writing as well, which was rather unusual at that time. While then-editor Roy Thomas may have seen some writing talent in Starlin (to go along with his extraordinary illustrative skills), it’s likely that the bigger factor in giving him the chance to write was the huge expansion of the line that was then taking place, which created a lot of new assignments that desperately needed filling. As it turned out, Starlin’s “regular” assignment on Iron Man wouldn’t be so regular, as he was booted off the book after just three issues: an “additional pencils” credit on issue #53 (Dec. 1972); “plot, pencils, and character conceptions” on #55 (Feb. 1973); and “pencils” of a Steve Gerber script for issue #56 (Mar. 1973). It was this last issue that did him in—Stan Lee saw it, hated both the story and the art, and immediately commanded that a new artist be assigned to the strip. It could have been a deathblow to Starlin’s career, but it wasn’t. Because that one issue where Starlin took the bulk of the creative credits (#55) was all he needed. In that story, he gave us Drax the Destroyer, Thanos, Mentor, Eros, Chronos, ISAAC the Living Computer, the Blood Brothers, and established Titan (one of the moons of Saturn) as a hidden, outer-space paradise. If Stan had seen this issue instead of #56, maybe he would have formed a different opinion of Starlin’s talents. But then again, maybe not—Stan was done writing by that point and wasn’t paying very close attention to the comics anymore, so it’s possible he had lost his eye for talent. Or he’d lost touch with the audience’s changing tastes and where the industry was headed. In any case, it seemed Stan still had the Midas touch (even if it was a happy accident), because bumping Starlin off of Iron Man would lead to a much better opportunity for him—one that would set him on the road to becoming one of the biggest superstar creators of the Bronze Age. But before we get to that we need to backtrack a couple of eras. Back in the Golden Age of comics, one might naturally assume that Superman was the most popular superhero, but such an assumption would be wrong. At its peak, Fawcett’s Captain Marvel line of comics sold better than National/DC’s Superman. Since they couldn’t beat Cap on the newsstands, National decided to try and beat him in court, filing a copyright infringement lawsuit that claimed Cap was a Superman rip-off. When the popularity of superhero comics collapsed in the early 1950s, Fawcett didn’t see the legal battle as being worth the effort anymore, and ceased publishing Captain Marvel. Fast forward to the late 1960s, and Marvel Comics creates their own Captain Marvel, mainly to strengthen their legal hold on the word “marvel”—at least as it pertained to all things comics related. It’s also likely they were thinking that name association with the very popular Golden Age character could be a sales booster. Now take a bit of a smaller time jump to the early 70s. The Marvel line is expanding at an outrageous rate, more than tripling their output of titles. This creates plenty of opportunities for a new generation of young writers and artists to break into the comics business. Most of these twenty-somethings fell in love with comics by reading the original Lee-Kirby and Lee-Ditko books and so they lust for assignments on those classic titles like Fantastic Four, Spider-Man, Hulk, Thor, Iron Man, Avengers, etc. [M]ost of the current comics professionals—the third generation, as they call it in rock music—now having been raised almost exclusively on comic books, not looking very far afield for new stimulation. So they’re still reacting to the books and the publishing business as comics fans. From “An Interview with Steve Gerber,” The Comics Journal #41, August 1978, p. 42. On the flip side, no one was really lusting after an assignment on Marvel’s Captain Marvel. As the character was created in late ‘67, he wasn’t part of that initial crop of beloved characters that sprang from Lee, Kirby, and Ditko in the early 60s. Plus, he was created primarily for legal reasons, and was therefore not as artistically pure, not as “legit,” as any of the aforementioned beloved characters. By 1973, the title had already been cancelled once (albeit briefly), and was on the verge of being cancelled yet again. Since the book was already circling the drain, Roy Thomas decided, in the wake of his dismissal from Iron Man, to give the book to Starlin to see if he could do something with it. A very serendipitous turn of events for both Starlin and comic lovers everywhere. 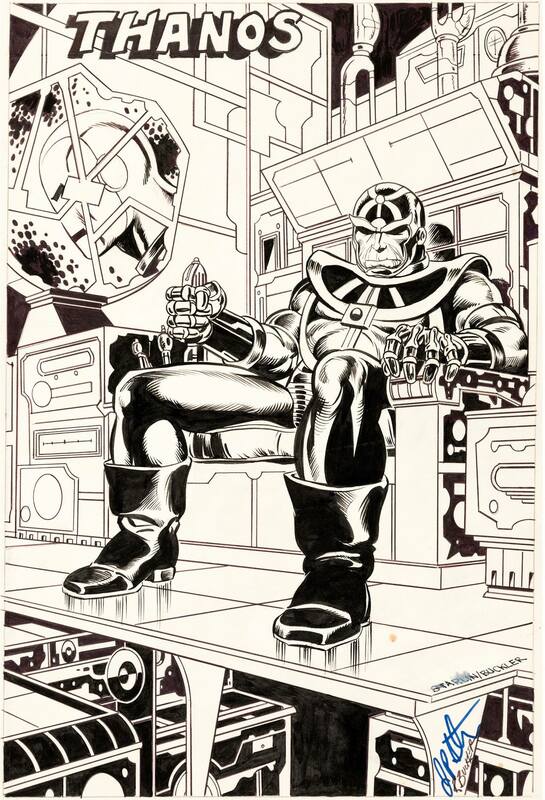 An early concept drawing of Thanos by Jim Starlin and Rich Buckler circa late ’72. After I got out of the service I took some community-college classes, and among them was a psychology course. I was exposed to Thanos [Thanatos] and Eros [Greek deities representing death and love, respectively], and the New Gods were out at that time. I have to tell you that Thanos was inspired by the New Gods, but not [by] who you think it was. 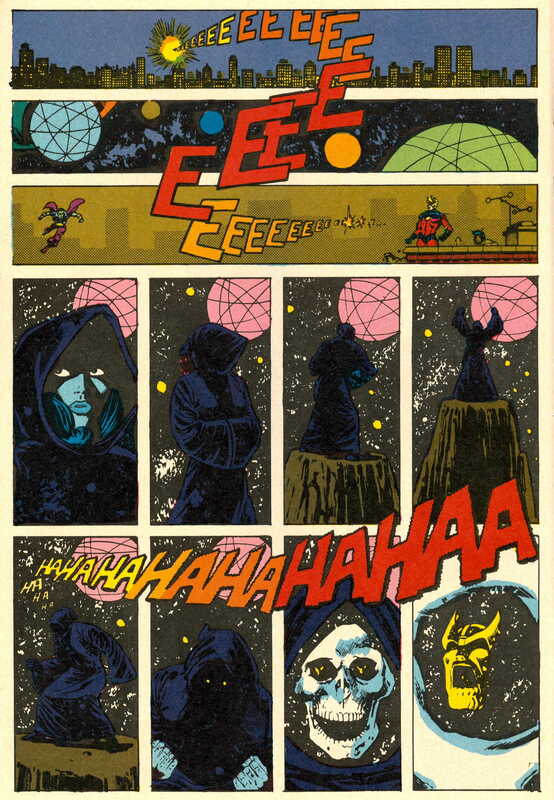 Thanos was going to originally be a rip-off of Metron. He had the chair and everything when I brought it into the Marvel office when we were doing Iron Man. Roy kind of looked at it and said, “Why don’t we bulk him up and get rid of the chair?” And so we bulked him up, and as the issues went on he kept getting bigger and bigger, and so everyone thought he was a Darkseid rip-off when in reality he was a Metron rip-off…. I came up to the office with a few sketches of Thanos and Eros and Mentor. I had that whole Titan thing sorted out. I had the designs, but not the story. From “A Chat with Jim Starlin,” Back Issue #48, May 2011, p. 46. I’ve already written extensively on Thanos before, several years back at the original bloghome, but to reiterate briefly: Thanos was completely unlike any character seen in comics before. I’m not talking about superficial things like his look or his powers; I’m referring to his personality. Thanos was the bleakest, most nihilistic character that comic fans had ever seen before—or since. His unique nature was so significant, such a radical break from nearly everything that preceded him, you could very well mark his introduction as the beginning of the Bronze Age. Starlin picks up Captain Marvel with issue #25 (Mar. 1973), and though the villainous “Masterlord” does not expose his face in the story, he will be revealed in the next issue (#26, May 1973) as Thanos. Over the course of this staggering storyline, Starlin offered a number of high-profile guest stars, which probably helped give the title a few extra looks from more casual fans. Among these guest stars were the Thing (issue #26), as well as the entire Avengers roster for the majority of the storyline (#27-33). Among the villains were the Super-Skrull and Iron Man’s foe, the Controller. This is all in addition to the Titan characters, who had their backstories fleshed out in more detail. And finally, there are a couple of crossovers with other titles like Avengers, Marvel Feature and (believe it or not) Daredevil. 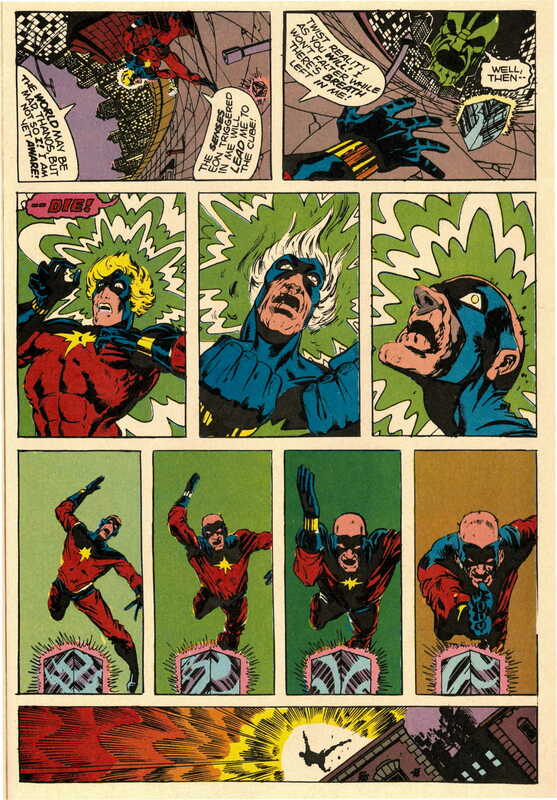 Along the way, Starlin sends Cap on a spiritual journey that changes him externally (with his silver hair turning blonde) and internally (as he attains “cosmic awareness”). The main plot centered on Thanos’s efforts to obtain the Cosmic Cube, a goal he actually achieves. He uses the cube to bind the virtually omnipotent Chronos, and then drains the object of all its energies to make himself a god. After beating his opponents at every turn on his way to achieving absolute power, the reader can’t fathom how the heroes can possibly defeat Thanos. Then, when they somehow manage to do so, the reader is left basking in relief and awe. It should be noted that Starlin’s art was amazing here, matching the greatness of his writing—which is really saying something. This initial Thanos epic wrapped up after a year and a half in Captain Marvel #33 (Jul. 1974). Starlin did one more issue of Cap (#34, Sept. 1974) before leaving over a creative dispute. Despite the fact this dispute was settled rather quickly, Steve Englehart had taken over the book as writer in the interim, so Roy Thomas asked Starlin if he might be interested in working on another character. Starlin picked Adam Warlock, beginning the character’s revival in the pages of Strange Tales #178-181 (Feb.-Aug. 1975) and then continuing in a restored solo comic that picked up the numbering of the previous series with Warlock #9 (Oct. 1975). The title would end (after another, more serious, creative dispute) with Starlin’s last issue, #15 (Nov. 1976). Mentor and Eros would not be regulars here as they had been in Captain Marvel; instead Starlin added new characters, Pip the troll and Gamora, to fill out the supporting cast. It should not have been possible, but Starlin somehow managed to increase the cosmic scope and psychedelica with Warlock. The saga begins with Warlock meeting an intergalactic, theocratic tyrant named the Magus, shortly after which he discovers the Magus is actually his future self. Despite the futility of fighting both destiny and himself, Warlock is determined to prevent the Magus from coming into existence. Thanos returns in the first issue of the solo mag’s revival (#9) as a seeming ally of Warlock, helping him to successfully complete a plan to journey into the future, kill himself, and steal his own soul with his soul gem—an act of “cosmic suicide” that prevents him from ever becoming the Magus. 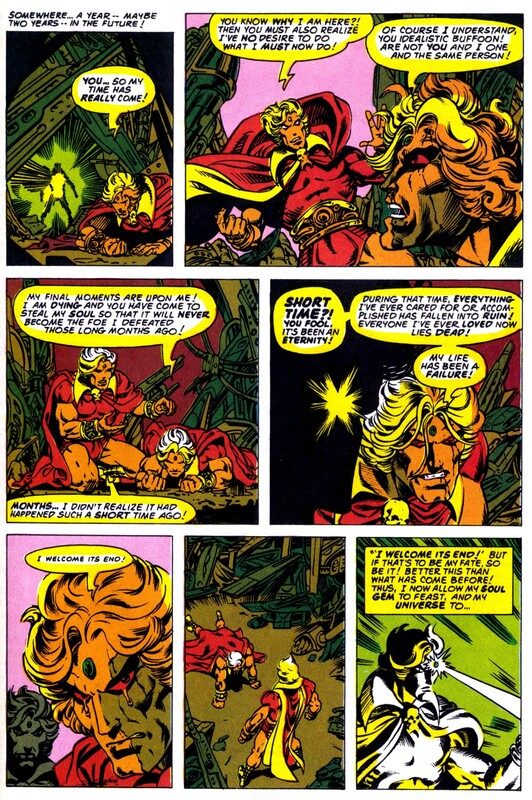 Adam Warlock commits “cosmic suicide” in the pages of Warlock #11 (Feb. 1976). SIDEBAR: If you find that the vampiric nature of Warlock’s soul gem evokes the evil sword Stormbringer from Michael Moorcock’s Elric series, it’s no delusion. Starlin was very much influenced by Moorcock’s albino emperor of Melnibone. Naturally, Thanos’s motives in helping Warlock were anything but pure. Turns out that the Magus—evil despot though he may have been—was also the “champion of life,” and as such he was the only being capable of defeating the “champion of death,” Thanos. With him out of the way, Thanos had a clear path to complete his nefarious plans. The looming conflict with Thanos was a dangling plot thread when Starlin abruptly ended his run on Warlock. He would tie up that thread a year later in Avengers Annual #7 (Nov. 1977) and Marvel Two-in-One Annual #2 (Dec. 1977). The Avengers Annual featured the death of Warlock, treating us to the same death scene from Warlock #11, only from the reverse point of view, as the dying Warlock of the “future” had now become the dying Warlock of the present. The Marvel Two-in-One Annual ropes the Thing and Spidey into the proceedings, as Warlock, champion of life, briefly returns from the dead to bring justice to Thanos. When asked if there was anything he might change about the way he wrapped up the Thanos storyline in the two annuals, Starlin said, “I am very satisfied with it the way it is. I got to do what I wanted” (BI #48, p. 32). Every generation can fall prey to that trap of “the way they did it in my day was better.” But honestly, I think I can say that about the 70s comics that I grew up on with considerable factual support. In those days, creators were paid flat rates, usually per page. They had no ownership of their work and were paid no royalties. This was terribly unfair to the writers and artists back then, but there was one extraordinarily positive side effect: It rendered nearly all the work produced during this time labors of love. Hardly anyone was doing it for the money; they were in it to make the best possible stories. Thanos the character has made (and is making) a lot of money for Marvel, but he was not created with profits in mind. The character is artistically pure, and this is a big part of what makes him great. As John Romita Sr. recalled: “Starlin turned down the FF [Fantastic Four], and that was the first time I ever heard of a professional comic artist—they used to be so grateful to get a steady book that they would crawl on their bellies—turn down a book. He said he didn’t want to be ‘tied down’ to it” (Sean Howe, Marvel Comics: The Untold Story, New York: HarperCollins Publishers, 2012, p. 147). Starlin’s reasoning at the time made sense. Without that monetary incentive, why would anyone with any artistic ambitions want the FF assignment? Why not take on books like Captain Marvel and Warlock instead? The pay is the same, no one bothers you, and you have the freedom to do what you want. In fact, by the end of his Captain Marvel run, the title had grown so popular that people in the office were starting to give it a lot more attention. As a result, Starlin began turning in his finished pages as late as possible so as to avoid editorial meddling. Had there been a royalty system back then, maybe Starlin takes the FF assignment and hacks it out for the bigger payday. But this would have meant a lot more editorial oversight and interference, a lot less freedom, and a lot less pleasure at the drawing board for Starlin. And maybe we never even get Thanos and the rest of the Titan cast. With the two annuals, Starlin had laid Thanos and Warlock to rest. With The Death of Captain Marvel graphic novel in 1982, Starlin finished off the other signature character of his early career at Marvel. In between, he had done some work for DC on Legion of Super-Heroes and DC Comics Presents. It seemed clear, at least at the time, that Starlin was ready to move on from his earlier work and try some new things. He created Dreadstar for the Epic line under the editorial eye of Archie Goodwin, which took up the bulk of his time in the mid-80s. In the late 80s he worked on several Batman projects for DC, plus a few other things here and there. By the time the 80s had turned into the 90s, Starlin would return to his roots—the intergalactic spaceways of the Marvel Universe. By the early 1980s, Marvel and DC had both established a royalty system for their creators. Writers and artists were finally getting a piece of the pie, however big or small. This was wonderful for the creators, but looking back now, we can see how the prospect of profits contaminated many of the creative decisions back then. This is something we need to keep in mind when examining Starlin’s work at Marvel in the 90s. Starlin took over the Silver Surfer book (technically the third volume) with issue #34 (Feb. 1990). Starlin was handling just the writing this go-round, while Ron Lim did the penciling. Right out of the chute, with this first story, Thanos was back to terrorize the universe. With Thanos not having made a proper comics appearance in over a dozen years, some may have wondered if the character’s appeal had waned over that time, but it hadn’t. Sales skyrocketed. When a comics property got popular in the 90s, this meant foil covers, multiple cover variants, prestige-format books, polybags with trading cards, and special crossover event series. And this is how we got Thanos Quest, Infinity Gauntlet, Infinity War, Infinity Crusade, and Warlock and the Infinity Watch. The initial, event-series spin-off, Infinity Gauntlet, featured the return of not only Adam Warlock, but Pip and Gamora as well. In resurrecting Warlock, Starlin confessed that, “there was another writer who was gonna bring him back, and I freaked out when I heard it. That’s when I brought him into the Infinity Gauntlet series. I couldn’t imagine anyone else handling him the way I would. I enjoyed it, but if I had to do [it] over again, I wouldn’t have brought him back” (BI #48, p. 45). Truthfully, those initial Surfer stories were fun and it was a joy to have Thanos back. Subsequently, Infinity Gauntlet wasn’t terrible, and again, it was nice to see Adam Warlock & friends again, even though I realized by this point that bringing back these characters was an artistic mistake. By the time we got to War and Crusade… oof. These books were bad. Not just bad, but getting bad to the point where it felt like it was damaging the original storylines, as well as the larger Marvel Universe at the time. SIDEBAR FUN FACT: Although the movie is called Infinity War, it seems to follow the plot of Gauntlet more than War. I’m curious to see what they’ll title the follow-up due to be released next year. Now the comics-reading generation that came up after me has a great fondness for these Infinity books (or at least Gauntlet), which I can understand, as they have warm childhood memories of meeting Thanos for the first time there. For myself, I find the original stories from the 70s far, far superior—in part because this is where my own nostalgia lies, but also because I believe the 70s stories are genuinely better. You can say that this is just my subjective opinion and therefore doesn’t hold any more value than the opinions of those younger fans who prefer the Infinity books… but we do know this much: we know which books were made out of love and which were made for the money. Previous PostFrom Owsley to PriestNext PostSenility Setting In?